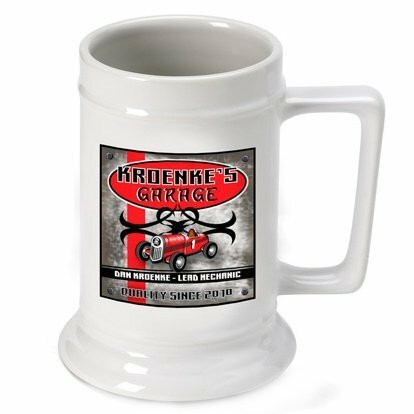 Whether he is a certified mechanic, a weekend tinkerer or someone who just wishes he could rebuild cars, he is sure to love this Garage Beer Stein that is personalized just for him. The bright graphic is printed on a classic white ceramic beer mug/stein and is dishwasher safe. This piece will hold up to 16 ounces of his favorite beverage while he works in the garage or just dreams of getting his hands dirty!